Ramu is also a Co-founder and Director of Cytespace Research and Medwell Ventures. Prior to establishing Cytespace in 2011, he spent more than 10 years with Quintiles Transnational. As the Vice President and Head – India, for Clinical Development Services, he managed all aspects of clinical trials conducted in thecountry. Holding diverse senior leadership positions, he was instrumental in creating two valuable assets for the organisation - the world’s largest multi-shift data management operations to process clinical trial data, and Asia’s largest cardiac safety lab. 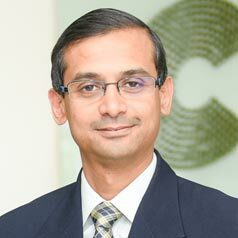 In his consulting role, Ramu advised on process improvement, cost management and customer relations at PricewaterhouseCoopers. He was also an early team member at a telemedicine start-up in India. He has a Bachelor’s degree in Engineering from the Indian Institute of Technology in Madras, and a Master’s in Business Administration from the Indian Institute of Management – Calcutta.